Toyota Camry is the Successor of the long-running Toyota Corona. For the first time, Camry was introduced to the world in 1982. Prior to the introduction of Camry, the Toyota Celica Camry was launched in 1979. Camry was introduced as a sub – model of the Celica series. Some think tanks consider Celica Camry as the predecessor of Toyota Camry. Since its introduction to the market, it has been through 12 generation. The present day generation came into the market in 2011. While there has been a new generation launched for the franchise in the present year. This generation will debut as the model for the year 2018. Before Camry, Toyota Corolla was the only car of this company that marketed throughout the world. But in 1992, Camry became Toyota’s second car to be marketed throughout the world. In 1992, the body style of Camry was enlarged to a mid-sized sedan. Through some impositions by the authorities, the smaller body style had to be retained in Japan due to an economic slump. But the mid-sized sedan body style of Camry was demanded more than the smaller one, in nations other than Japan. This made Toyota to produce both the body styles simultaneously. Camry has been a base design for some of the cars of Lexus series. With time, the series got independent in terms of designing the cars, but still today some of the cars from this brand resemble Camry. The present day Camry is in its 11th Generation. 12th Generation is up for the next year. Well, this one bears the base MSRP of $23,070. The model line has 7 models: Le, XLE, SE, XSE, Hybrid LE, Hybrid SE and Hybrid XLE. 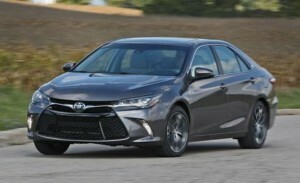 Toyota Camry comes in three performance versions. The Regular Camry, Prestige Camry and Hybrid Camry. The regular Camry has three drivetrains. The first being the conventional inline-4 cylinders, powered by 2.5 L engine. This drivetrain has 178 hp of power at 178 lb – ft of torque. The next is the hybrid drivetrain which consists of the same 2.5 L inline-4 cylinder engine. This drivetrain has 202 horses galloping at 157 lb – ft of torque. Then is the power machine, having a 3.5 L V6 engine with 268 horses running at 248 lb – ft of torque. The Prestige Camry holds only the V6 engine. In North American markets, the Hybrid Synergy Drive is offered with the Regular Camry. It comes with the 2.5 L engine having 200 horses. When we move out of the North American market, we get the 2.5 L Hybrid Camry as standard. Previously it was offered with a 2.0 and 2.4 L engines, along with the trim line of 2.5 L. But presently the 2.5 L inline-4 has been set standard drivetrain. For the Asian markets, only a 2.4 L engine was available previously. But now the engine line has been variated between two drivetrains. The 2.0 and 2.5 L engines have been made available. The 2.0 L has the 145 hp of power. While the 2.5 L is the Hybrid Synergy drive. The conventional drivetrain is matted with 4 and 6 – speed automatic transmission. While the hybrid models have the CVT transmission system. The combo of Hybrid Synergy Drive and the CVT transmission gives an impressive fuel mileage. Camry in this drivetrain gives 41 mpg as an average EPA. Initially, Camry was an entry level sedan. By 1991, the body style was transformed into a mid – sized sedan. The 11th generation has been heavily improvised in terms of its cosmetics and exterior designing. Toyota has used a refined sheet metal variant for the exterior of the car. The body length is certainly more than Toyota Corolla, but Camry resembles it in terms of styling. Camry could certainly bear the badge of the entry level executive car, but would rather not be rated as a highly stylized design. Well, you can get different wheels in every different model of Camry.Toyota Corolla, but Camry resembles it in terms of styling. Camry could certainly bear the badge of the entry level executive car, but would rather not be rated as a highly stylized design. Well, you can get different wheels in every different model of Camry. Along with the exterior, the interior designing for the 11th generation of Camry has received a lot of changes. 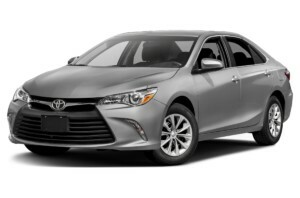 Well it does not resemble Corolla, but it does resemble the Toyota Avalon. Toyota calls it a sporty interior, but we would rather call it a family equipped apartment. It’s lushly décor family compartment, with beautiful stitches on the seats and ample space to sit. Camry allows adults of almost every height to fit in the car, especially in the back row. The back row has enough space for 3 passengers. While the trunk can easily bag your groceries and veggies. Camry comes with a 6.1-inch touchscreen infotainment system. The system has the Entune™ Multimedia support. Voice recognition support is also available for the Camry infotainment system. The Entune™ Audio System is the major sound system in Camry. The car contain six speakers for media playback. JBL audio package is also available for Camry and is even standard in some trims of the car. While fully featured Navigation stays optional.recognition support is also available for the Camry infotainment system. The Entune™ Audio System is the major sound system in Camry. JBL audio package is also available for Camry and is even standard in some trims of the car. While fully featured Navigation stays optional. This car has managed to get 5 stars in terms of safety. The passive safety of the car is sufficient. Under the heading of passive safety, we even get Whiplash Injury Lessening, Emergency locking retractor and LATCH. The active safety consists of the tire pressure monitoring system, radar sensors, lane departure alert and blind spot monitor. The driver’s assistance is enhanced with an advanced cruise control system. 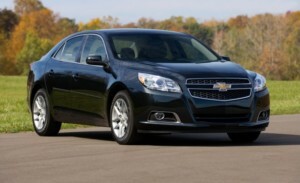 The Chevrolet Malibu is one of the closest competitors of Toyota Camry. There is no much difference we get in both the cars beside the price tag. Malibu is less costly as compared to Camry. 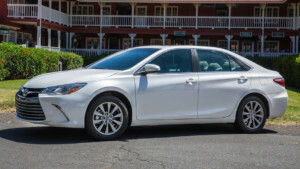 Fuel mileage and a decent price tag makes Camry a consumer favorite car. This is because of its decency, which makes it a vital choice.